John Farrow (n. Sídney, 10 de febrero de 1904 - Beverly Hills, 28 de enero de 1963) fue un director, guionista y productor cinematográfico australiano afincado en Estados Unidos. 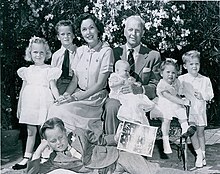 Se le recuerda también por su matrimonio con la actriz Maureen O'Sullivan, con la que para poder casarse, tuvo que convertirse al catolicismo. Tuvieron siete hijos, tres de ellas son actrices: Mia Farrow (la más popular), Stephanie Farrow y Prudence Farrow. A Bullet Is Waiting (1954). Plunder of the Sun (1953); Saqueo al sol. His Kind of Woman (1951). Where Danger Lives (1950); Donde habita el olvido. Red, Hot and Blue (1949). Easy Come, Easy Go (1947). Two Years Before the Mast (1946). Commandos Strike at Dawn (1942). A Bill of Divorcement (1940). Married and in Love (1940). Women in the Wind (1939). The Saint Strikes Back (1939). Comet Over Broadway (1938), sin acreditar). She Loved a Fireman (1937). La fuga de Tarzán (1936), sin acreditar. Around the World in Eighty Days (1956 película)|Around the World in Eighty Days]] (1956). Last of the Pagans (1935), como John Villiers Farrow). The Spectacle Maker (1934), como John Villiers Farrow). Inside the Lines (1930), diálogo). Shadow of the Law (1930). The Bad One (1930), historia). The Woman From Moscow (1928). Ladies of the Mob (1928). The Bride of the Colorado (1928). King of the Khyber Rifles (1953).